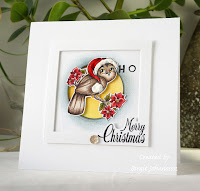 Another week at the Muse Christmas Vision blog and a guest designer ,Brigit has given us TWO beautiful inspirational cards !I choose to take my inspiration from the the one above ...awesome colouring by the way Brigit! - square card panel popped rather than inverted. - birds, like Brigit mine are wearing a santa hat and sitting on a branch. I coloured mine with promarkers and flex markers (prefer these to promarkers so flexible for tiny bits!) and added some 'snow glitter' to their hats. This is just perfect! I love your Christmas birds, and it´s a great take of my MUSE card:) I´m so honored that you found inspiration from it. Thanks for joining us at MCV this week. I always laugh when I see Christmas Cards with robins on them - in Canada, robins are spring, not winter birds. But their jaunty red breasts are perfect for Christmas! So glad you joined us at MCV this week, jenni! Jenni, love your take on Birgit's square card. The birds are too cute. Aww..they are so cute!! Love them! !